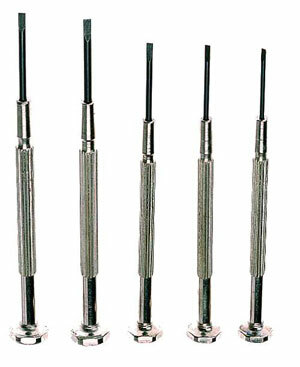 This set of five nickel-plated jeweler's screwdrivers is a must for installing or removing any small gauge screw. They have been designed with heads that swivel and blades that are permanently affixed to a knurled handle. Shaft blades range from widths of .049" to .079" with overall lengths between 3" and 3-3/8".